Import Prices Decline, Export Prices Rise: Impact on 1st Quarter GDP Estimates? The BLS report on Import and Export Prices shows prices of imports declined 0.2% in March following increases in each of the 3 previous months. Export prices rose 0.2%. This was the seventh consecutive increase in export prices. On the surface, this appears to be very good news for first quarter GDP but February revisions took away half of the gain. All Imports: Import prices fell 0.2 percent in March, after increasing 1.4 percent over the previous 3 months. 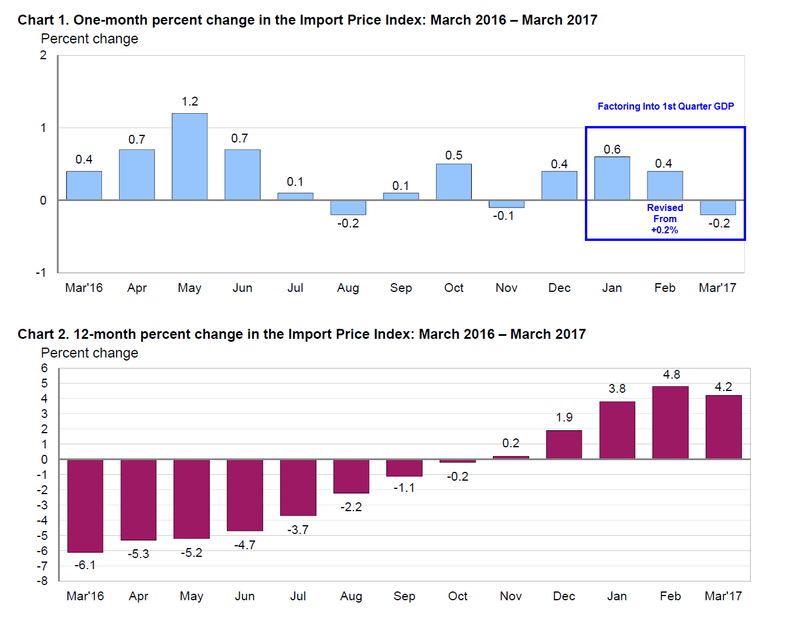 Prior to the March downturn, import prices trended up over most of the past 12 months, advancing 4.2 percent between March 2016 and March 2017. In contrast, import prices fell 6.1 percent for the previous 12-month period. Fuel Imports: The price index for import fuel declined 3.8 percent in March, the largest 1-month drop since the index fell 6.8 percent in February 2016. In March, a 3.6-percent decrease in petroleum prices and an 11.0-percent decline in natural gas prices contributed to the overall fall in fuel prices. The March decrease in petroleum prices was the largest monthly decline since the index fell 4.1 percent in August, and the drop in natural gas prices was the largest 1-month decrease since the index declined 20.0 percent in March 2016. Despite the March downturn, the price index for import fuel increased 50.2 percent over the past year, after declining 36.7 percent the previous 12 months. The March 2017 over-the-year increase was driven by a 52.1-percent advance in petroleum prices and a 53.8-percent rise in natural gas prices. All Imports Excluding Fuel: In contrast to fuel prices, prices for nonfuel imports increased in March, rising 0.2 percent. The advance followed a 0.4-percent rise in February and was led by higher prices for nonfuel industrial supplies and materials and capital goods. Those increases more than offset falling prices for consumer goods and foods, feeds, and beverages. The price index for nonfuel imports advanced 1.0 percent over the past 12 months, the largest over-the-year advance since the index increased 1.3 percent in April 2012. The increase from March 2016 to March 2017 was driven by higher prices for nonfuel industrial supplies and materials and foods, feeds, and beverages, which more than offset 12-month declines for each of the major finished goods categories. All Exports: Prices for U.S. exports rose 0.2 percent in March, continuing an upward trend since the index last fell on a monthly basis in August. Higher prices for agricultural exports and nonagricultural exports each contributed to the advance in March. 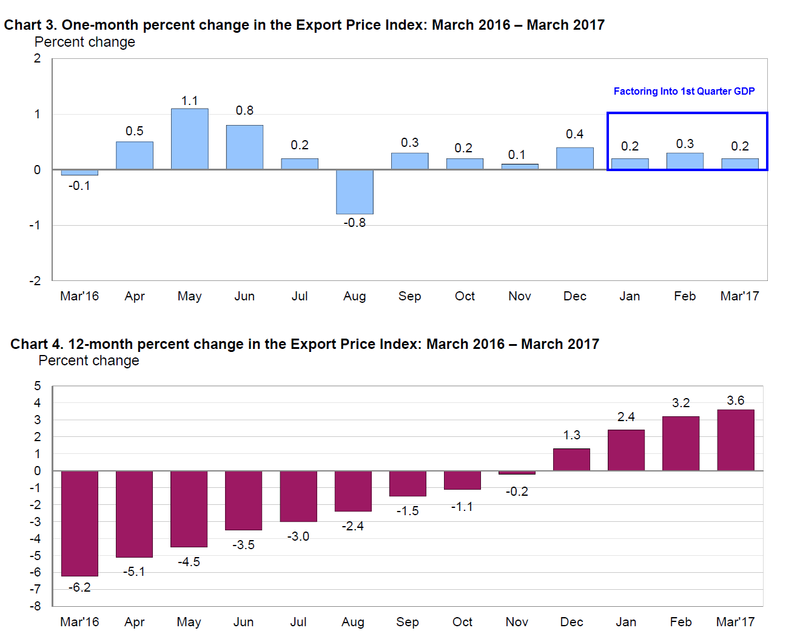 U.S. export prices also increased over the past year, rising 3.6 percent for the year ended in March. 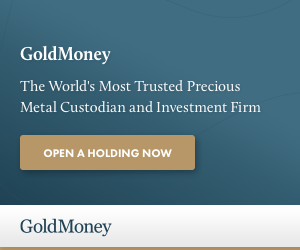 That matched the 12-month advance recorded in December 2011 and was the largest over-the-year increase since the index rose 4.8 percent in November 2011. Agricultural Exports: Export agricultural prices increased 0.9 percent in March, after rising 1.5 percent in February. The March advance was led by a 4.4-percent increase in meat prices and a 4.9-percent rise in nut prices. Prices for agricultural exports advanced 5.3 percent for the year ended in March, the largest 12-month increase since the index rose 9.6 percent in June 2013. Higher soybean prices over the past year were the biggest contributor to the March 12-month rise in agricultural export prices. All Exports Excluding Agriculture: The price index for nonagricultural exports rose 0.2 percent in March following a 0.3-percent advance the previous month. In March, higher prices for nonagricultural industrial supplies and materials, consumer goods, capital goods, and nonagricultural foods all contributed to the overall advance in nonagricultural prices. Prices for nonagricultural exports rose 3.3 percent over the past year, matching the 12-month increase in February; those were the largest over-the-year advances since the index rose 4.0 percent in December 2011. Effectively, import prices were flat as export prices rose 0.2% for the month. This will add a tick or so to GDP estimates for the first quarter but it will likely be at the expense of negative pressures for the second quarter.